Just discovered this great photo of Satish Kumar & fellow walker, E.P. Menon, taken 50 years ago during their 8,000-mile pilgrimage for world peace. They had already walked without any money & relying only on the kindness of strangers, from their starting point in New Delhi, India, through Pakistan, Afghanistan, Iran, Russia, Poland, Germany and France, before arriving in London. Here they stopped off to deliver a ‘packet of peace tea’ to Lord Atlee, who received it on behalf of the British Government. They then headed off to Wales to meet celebrated philosopher & activist Bertrand Russell, who was the original inspiration for their walk. Photo courtesy of Peace News. 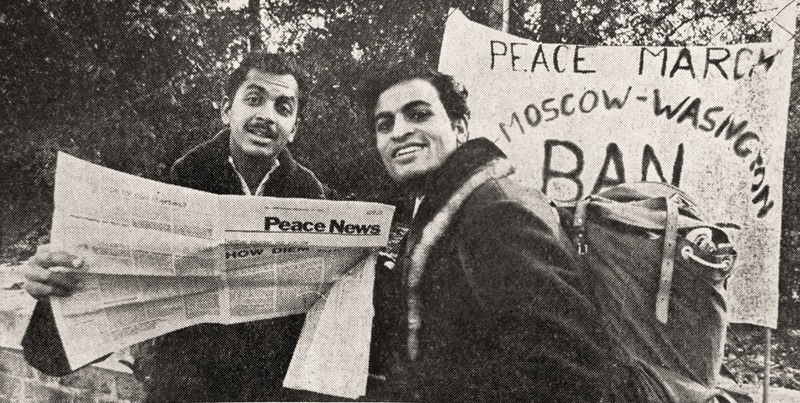 Satish Kumar (on right) & fellow walker, E.P.Menon in England 1963.